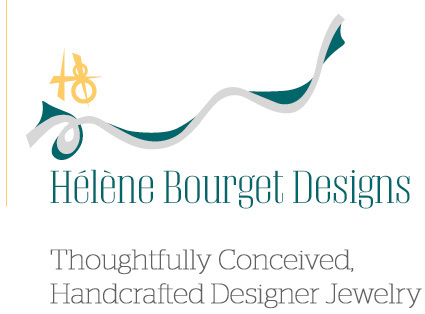 Hélène Bourget is a designer goldsmith specializing in custom, handmade, fine jewelry. Unique and personalized, the work transcends the ordinary and becomes wearable art. Hélène uses only the finest materials; white and yellow gold, platinum, Elite silver, Sterling silver, diamonds and a beautiful array of colored gemstones. Each piece of jewelry is designed and hand crafted based on to-scale sketches created during a design consultation. Hélène is pleased to offer bridal jewelry, 'milestone' rings, engagement rings, wedding bands, bracelets, pendants & necklaces and earrings. Nothing says love like a one-of-a-kind, designer piece tailor-made to your personal taste, whether you are celebrating a special occasion, or simply indulging in the enjoyment of a beautiful object. For a look at past work please visit the Design Gallery or for the latest projects, the Recent Work tab as well as the testimonials from real, very happy clients. For more information and upcoming events, please follow Hélène's Blog. Hélène invites you to contact her to arrange a personal consultation in her studio.